Terry Noland’s 1958 rockabilly hit “There Was A Fungus Among Us” may not have been a direct reference to mushrooms when it was released. But the title merits momentum today, when there are many fungi among us in nature and in our kitchens. Researchers have recruited them for soil remediation, water filtration and even oil spill cleanup. ​But despite their purported versatility, the power of mushrooms remains largely untapped, El Metennani said. The longtime chef decided to do something about the mushroom void. After leaving the restaurant business, El Metennani founded an urban fungi farm, Fruiting Mushrooms, hoping to emphasize the importance of locally produced organic food, he said. He incubated the start-up in a basement area in The Plant, a meatpacking facility-turned-sustainability destination for small food businesses in Chicago’s Back of the Yards neighborhood. He is in the process of moving and expanding. El Metennari grows three types of mushrooms, which he distributes to local markets via Midwest wholesaler Local Foods. Oyster mushrooms, his most popular variety, are ready for harvest just two to three days after they “pin,” or sprout, he said. Lion’s mane mushrooms, which look more like cheerleader pom-poms than fungi, take slightly longer to grow and are known for their flavor properties. And reddish-brown reishi mushrooms, which convey their medicinal qualities through teas and soups, are called “immortality mushrooms” in their native China, he added. When most people think of medicinal mushrooms, they imagine “magic” hallucinogenic properties, El Metennani said. However, fungi actually can ease serious conditions like post-traumatic stress disorder and Parkinson’s disease: “They go directly to our nervous system,” he said. The Fruiting Mushrooms production system is what El Metennani calls “agriculture for the future.” The farm, which produces three varieties of exotic mushrooms, is powered primarily by solar and wind energy supplied by The Plant. “In our concept, we use only 5 percent of the water that we normally use in conventional agriculture trying to grow mushrooms,” El Metennani added, noting that Fruiting Mushrooms uses mostly repurposed rainwater to meet moisture requirements. 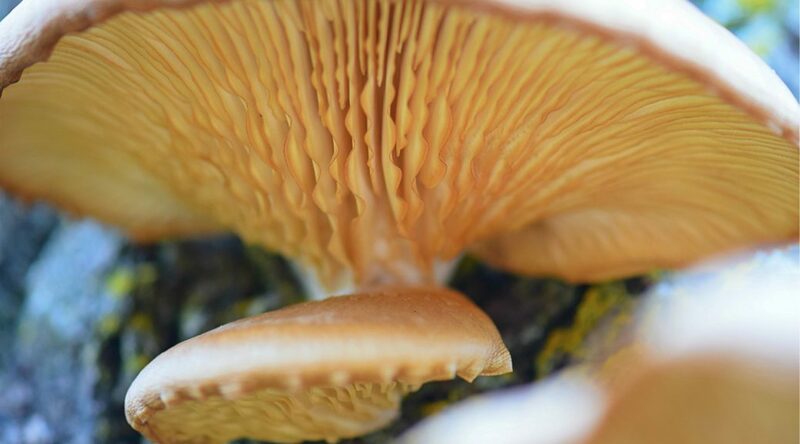 Unlike fruits and vegetables, mushrooms don’t rely on sun, soil and water to grow. Instead of deriving fuel from photosynthesis, fungi result from single-celled units called spores. When spores germinate, they produce masses of interwoven structures called mycelium. El Metennani combines mycelium with recycled materials to build punching bag-like growing structures. The vertical system is an attempt to mimic nature, he said, adding that humidity, light, temperature and carbon dioxide levels are carefully regulated in the production area. This recycling system is an example of closed-loop production, meaning outputs from one process are inputs for another, said Stef Funk, education associate at Plant Chicago, a non-profit organization that supports businesses at The Plant. The effort isn’t just an attempt to save money or alleviate the landfill eyesore — it has a significant impact on air quality, she added. Currently, El Metennani is at the forefront of an initiative to convert an abandoned school in Garfield Park into an agricultural facility, bringing the closed loop cycle to a new space. Eventually, the 75,000 square foot space will house 12 to 15 farms, all sharing laboratory, processing, production and packing areas, he said. And for El Metennari, the local aspect of production is just as important as the mushrooms themselves. Mushrooms are the perfect medium to pursue that larger mission, El Metennari said.